The combination of herd life and positive human interaction teaches the filly good social skills, helping prepare her for whatever life has to offer. 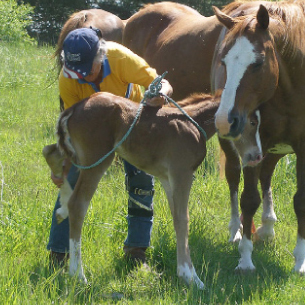 Imprinting a foal refers to a training technique made popular by Robert Miller, DVM. As defined in the dictionary, imprinting is "a rapid learning process that takes place early in the life of a social animal and establishes a behavior pattern (as recognition of and attraction to its own kind or a substitute)." Twenty-four to 48 hours after birth is the period when some species, including horses, may be imprinted. Lessons learned at this early age can last a lifetime. Imprint training is efficient; a lesson learned in a few minutes after birth may save you hours of problems later. 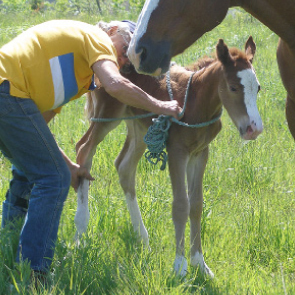 Imprinting gentles the foal and prepares it for schooling and veterinary work later. Early exposures to certain stimuli allow the foal to accept the same stimuli later without fear, especially regarding humans. This technique includes doing things like rubbing the foal all over, pulling at ears, putting on a halter, putting pressure on the poll, taking a temperature, picking up feet, and making loud noises. The techniques associated with imprinting should be done for two or three days in a row, taking about half an hour each time. After the first 24 hours, it is no longer imprinting, but habituation. One concern with imprinting is the restraint of the foal. 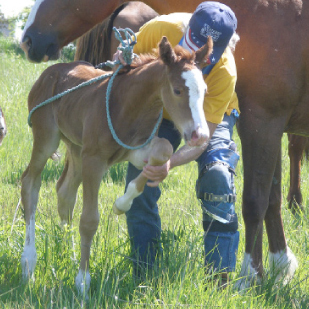 If the foal struggles and the trainer releases it, the foal learns it can struggle to escape handling. This idea becomes imprinted on the foal and is extremely difficult to change. So, done wrong, imprint training can cause problems. 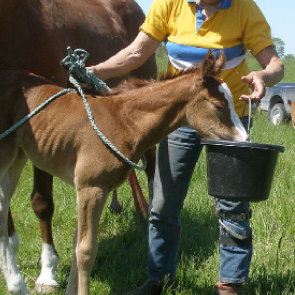 Before trying to imprint your own foals, consult a horse trainer, a veterinarian, and Dr. Miller's learning aids, which include the book Imprint Training and the DVD Early Learning. 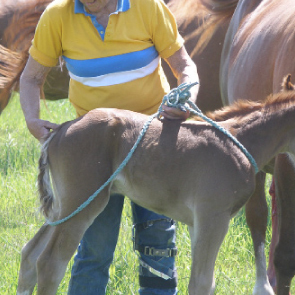 Donna Kromroy of Albia, Iowa, imprints her new foals, working with each mare and foal loose in the herd. Since she interacts with her herd each day, the mares accept her presence and are not threatened by her approach to their babies. 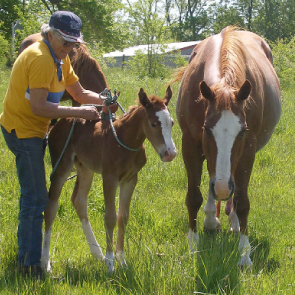 If you do not have a super relationship with your mares, you would be better off doing your imprinting in a more controlled area with the mare tied or held by a helper. 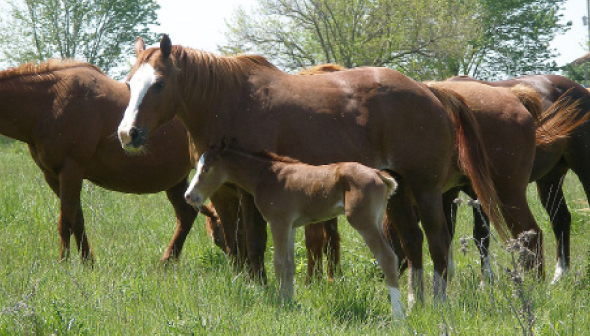 The first few hours after foaling are the mare's most protective time. One loop goes around the foal's buttocks about where a breeching would sit, and the other loop goes around the base of the neck. Donna begins the imprinting process by sharing breath with this filly. Using her fingers, she gently probes each nostril and around the opening to simulate tubing. To desensitize the inside of the mouth for future application of paste wormer, Donna rubs the gums and plays with the tongue. She handles each ear, inside and out, rubbing and probing until the filly submits to the touch. 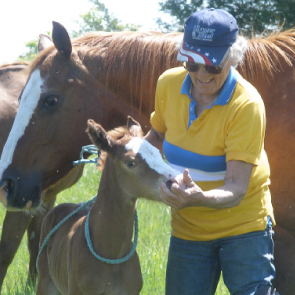 Donna rubs the front of the filly's body, works her way down the near leg, and asks the filly to pick it up and hold it quietly several times. She gives the filly a hug, putting pressure around the heart girth where the harness or a saddle will someday be snug. She then works her way to the dock area and under the tail to simulate getting a temperature reading. Moving around to the off side, she repeats everything; the filly is again asked to yield a foreleg. Donna does not forget to handle the delicate parts that one day will need cleaning. Working her way back and down the off hind leg, she again asks the filly to give her leg. Donna now asks the filly to yield to the rope's pressure and follow her away from her mother. The bucket serves as strange object to be seen as non threatening in the hands of a person. Donna gently waves the bucket, bumps the filly with it, and moves it out of her peripheral vision. 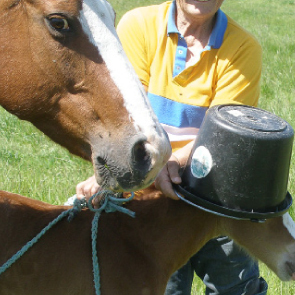 With quiet dignity the filly accepts the loss of her eyesight and the bucket touching her ears. Bethany Caskey of Albia, Iowa, believes she was imprinted by Roy Rogers and the Lone Ranger. This article appeared in the Spring 2008 issue of Rural Heritage magazine.